Appearance: Irori wears his twin katana on his back. He has a large pouch on the back of his belt and a shuriken pouch on his right thigh. He is often seen in his green jacket with a cream shirt. His pants are green brown. His has a small and scrawny physique. He stands at 4 feet tall. He has brown hair and eyes. His completion is fair. He only weighs 90 pounds. His is near sighted so he has to wear glasses. 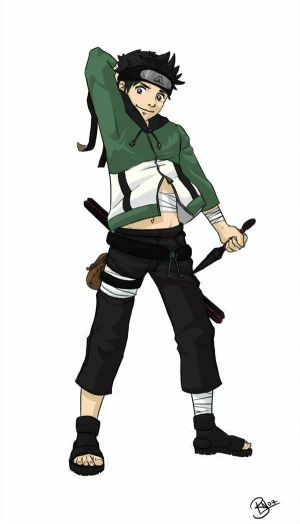 History: Born to a blacksmithing family of the hidden leaf, Irori always wanted to be a shinobi. He was enrolled in the academy as soon as he was old enough. He was always weaker in ninjutsu, genjutsu, and taijutsu. However, he was always near the top at kenjutsu. His scores were mediocre, but passing. Irori has talents in his family's shop, being a adequate smith and inventor at the age of 10. His life has been very uneventful so far. He dreams to become a great shinobi. 1. what kind of swords do you have? 2. on the kunai bomb, is it just one or do you have more then that? 3. what do you mean "the" blacksmith family of the hidden leaf, are you suggesting that your in a legendary blacksmith family in the hidden leaf? from what i believe Konohagakure doesn't have a blacksmith family in general. 4. because there is no such thing you are going to have to make a super long history on this blacksmith back round, like how it came about and what they make. or if legendary, how so?